This stunning brand new model two bedroom lodge has been added to the Atlas range. 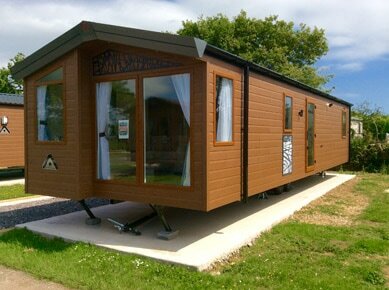 Our new Sapphire lodge has just arrived and been located on its plot in our new development. It comes with canexcel cladding, double glazing, extra insulation and central heating. The sapphire is a cosy holiday home that exudes luxury and provides a perfect ambiance of chic comfort. It benefits from all the home comforts you would expect. It has stylish lounge seating, modern fireplace, free standing dining furniture. The kitchen is well equipped and comes with fridge freezer, integrated microwave, modern gas cooker and hob with deluxe extractor fan. The sapphire has modern en-suite shower rooms to both bedrooms. The second bedroom has two three feet single beds and the master bedroom has a kingsize. This unit comes complete with a large UPVC matching balcony and caravan skirt. We also include the delivery, siting, connection, outside tap and electric point and a digital arial. The lodge has Tarmac parking adjacent to the holiday home for your conveinience. This unit forms part of our new lodge development at the top of the park. This area has fantastic views out across the Axe valley.